You’ve got Velocity rims in an obnoxiously (but wonderfully) bright color, and you’ve got a frame painted shades of awesome. What’s next? Some tires to match. 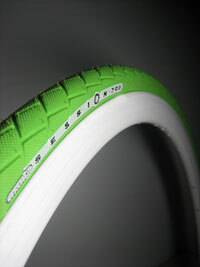 Check out these great looking clinchers from Fyxation. At $50 a tire you’re not going to want to do a lot of skid-stops, but you are going to look good while you’re trackstanding on your way to Stumptown or Philz.